Background: Gene polymorphisms have been associated with drug-induced liver injury (DILI). This study aimed to elucidate the association between polymorphisms of NAT2, CYP2E1, GSTT1, GSTM1, and HLA genes with isoniazid plasma concentration and DILI. 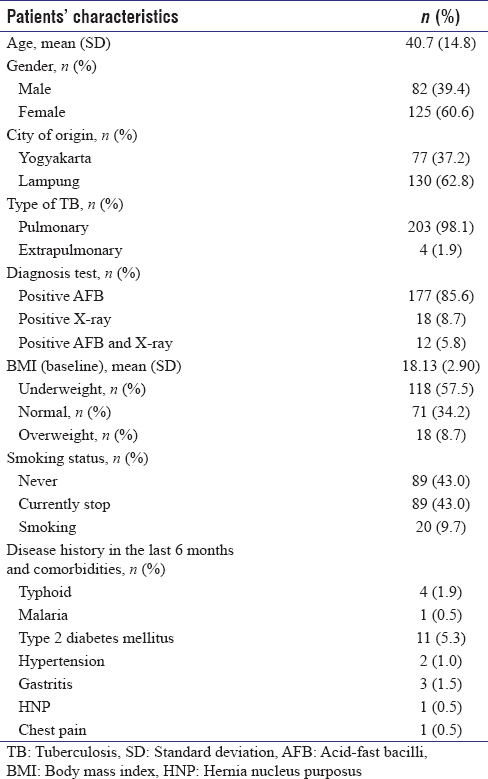 Methods: This study was a prospective cohort study recruiting adult newly diagnosed tuberculosis (TB) patients who met the inclusion criteria from the Public Health Centers in Yogyakarta and Lampung. Defined single-nucleotide polymorphisms were rs1799929, rs1799930, rs1799931, rs1801280, and rs1041983 of NAT2; rs2031920, rs8192775, and rs2515641 of CYP2E1; rs1041981, rs1063355, and rs6906021 of HLA. GSTT1 and GSTM1 were defined as GSTT1, GSTM1, and GSTT1 deletion and GSTM1 deletion. The DNA was taken from the patient saliva. Data of anti-TB drug plasma concentration on the weeks 4–8 of treatment were retrieved from the patients' medical report. Statistical analysis was performed using Chi-square test, Student's t-test, and multinomial logistic regression. Results: Over the 207 patients, up to 1.9% of them experienced DILI. The percentage of slow acetylators of NAT2 was 69.5%. Patients with extensive acetylator phenotype did not experience DILI (odds ratio [OR]: 0.46; 95% confidence interval [CI]: 0.23–0.94). The G carriership of HLA rs1063355 could protect the patients from the DILI (OR: 0.39; 95% CI: 0.14–0.9). Furthermore, the C carriership of HLA rs1041981 can protect the patients from DILI (OR: 0.38; 95% CI: 0.15–0.50). The genotype of HLA-DQB*0302 significantly affects the isoniazid concentration. Conclusion: The NAT2 genotype was significantly associated with DILI. Furthermore, the absence of G carriership of HLA-DQA*0102 could protect the patients from DILI without being associated with an effect on the isoniazid concentration. The World Health Organization (WHO) reported in 2017, that in 2016, the mortality of tuberculosis (TB) cases in Indonesia reached 110,000 with 42/100,000 persons. Indonesia is in the second rank of TB burden after India. Measures to improve the success of programmatic treatment of TB are urgently needed, including programs for drug resistance, duration of treatment, adverse drug reactions (ADRs), relapse, and prolonged infections. Several genetic polymorphisms have been associated with hepatotoxicity but have not been studied together and combined with isoniazid drug concentrations. The aim of this study was to elucidate the association between the polymorphisms of NAT2, CYP2E1, GSTT1, GSTM1, and HLA genes in combination with isoniazid plasma concentration and hepatotoxicity. This study was approved by the National Ethics Committee on Health Research, Jakarta, Indonesia, Number: KE 01.06/EC/531/2012. Written informed consent was obtained from all patients. This study was a prospective cohort study recruiting adult newly diagnosed TB patients from Public Health Centers in Yogyakarta and Lampung. The inclusion criteria were newly diagnosed of TB patients. The diagnose of TB used the result of sputum test which showed the positive result for Acis-Fast Bacili (AFB) and X-ray results, were treated with fixed-dose combination of anti-TB drugs dosed according to the WHO guidelines, and had normal function of the kidney and liver at the baseline measurement. The exclusion criteria were participants fulfilled the inclusion criteria who are having human immunodeficiency virus and/or diabetes mellitus history, liver abnormality history, abnormality of the renal and/or liver function, and reactive results of hepatitis B surface antigen test. The DNA was taken from the patients' saliva using an Oragene DNA collection kit (DNA Genotek, Ottawa, Canada) and all the samples were purified using GlycoBlue Coprecipitant (Thermo Fisher Scientific, Waltham, USA). The quality of DNA was verified by NanoDrop™ spectrophotometer measurement. GSTT1 and GSTM1 were defined as GSTT1, GSTM1, and GSTT1 deletion and GSTM1 deletion. PCR was carried out according to the literature, using PrimeSTAR Polymerase (TAKARA BIO INC., Shiga, Japan). PCR products were analyzed by 0.8% agarose gel electrophoresis. The presence of the deletion and the presence of the gene were tested separately because of their difference in fragments length (625 and 969 bp for the genes and 3106 and 4748 bp for the deletions, respectively). Data of anti-TB drug plasma concentration on the weeks 4–8 of the treatment were retrieved from the patients' medical report. Plasma samples had been collected in 57 TB patients, 2 h after administration of the drug in fasted condition.,,, The samples were processed after sample collection and subsequently stored in the frozen condition until routine analysis. The method has been validated previously., The mixed solution was vortexed for 15 s and was centrifuged for 10 min at 10,000 rpm. The supernatant was taken from the solution and was used for the next process. Ether (3 ml) was added to 100 μL of the supernatant, and the water phase was taken. The 20 μL water phase was injected into the high-performance liquid chromatography system. The accuracy and the intraday–interday precisions met the criteria from the US Department of Health and Human Services Food and Drug Administration. We defined the normal range of Isoniazid, Rifampicin, Pirazinamide, Ethambutol (HRZE) as 3–6 μg/ml, 8–24 μg/ml, 20-50 μg/ml, and 2–6 μg/ml, respectively. Data were analyzed using Chi-square test, Student's t- test, and multivariate analysis. Multinomial logistic regression was performed among phenotype of NAT2, GSTT1, GSTM1, rs2031920 (CYP2E1), rs2515641 (CYP2E1), rs8192775 (CYP2E1), rs1041981 (HLA), rs1063355 (HLA), and rs6906021 as independent variables and DILI as a dependent variable. In total, 232 newly diagnosed adult TB patients from Yogyakarta and Lampung were screened and 207 met inclusion criteria and were recruited. Patient characteristics are shown in [Table 1]. Most of the patients were female (60.6%), with a mean age of 40.7 (standard deviation: 14.8). Most of the patients had a positive result of the AFB test (85%) and around 57% of them were underweight. The average of body mass index was also in underweight condition (18.3). Only around 8% of the patients had comorbidities or disease history and Type 2 diabetes mellitus was the most prevalent comorbidity in this study (4.0%). Increased ALT and AST was predominantly observed in the 2nd month of TB treatment [Table 2]. In total, 1.0%, 1.9%, and 1.0% of the TB patients experienced mild DILI based on increased ALT, AST, and ALT-AST, respectively. The occurrence of DILI was not associated with any of the patients' characteristics (data were not shown: P > 0.05) [Table 1]. The NAT2 genes are phenotyped into extensive (25.0%), intermediate (5.6%), and slow acetylators (69.5%). In CYP2E1, the CC of rs2031920, GG of rs8192775, and CC of rs2515641 had the highest percentages of the genotypes (72.2%, 72.4%, and 62.4%, respectively). The percentages of GSTT1 homozygous deletion and GSTM1 homozygous deletion are 9.4% and 21.6%, respectively. The percentages of GT of HLA-DQA*0102 and CC of HLA-DQB*0302 are the highest compared to the other genotypes (44% and 29%, respectively). The results of association analysis between the genes polymorphisms and DILI are presented in [Table 3]. The highest percentages of genotypes which experienced DILI were 48.9% of slow acetylators of NAT2, 50% CC of rs2031920, 41.7% CC of rs2515641, and 66.4% G carrier of rs8192775 of CYP2E1. Among the GSTT1 and GSTM1, the highest percentages of DILI patients were seen in the homozygous wild-type and heterozygous, which are 62.6% and 51.4%, respectively. Moreover, among the HLA, the highest percentages of patients who experienced DILI were a presence on the G carriers of HLA-DQA*0102 ( 53.6%), CC and CT genotypes of HLA-DQB*0302 ( 41.7%), and C carriers of rs1041981 (35.4%). There were no significant associations between gene polymorphisms of CYP2E1, GSTT1, and GSTM1 and the risk of DILI. A significant association was found between the NAT2 phenotype and patients experiencing DILI. Patients with extensive acetylators phenotype did not experience DILI (odds ratio [OR]: 0.46; 95% confidence interval [CI]: 0.23-0.94). The authors find that T carriers of rs2515641, homozygous deletion of GSTM1, and TC carriers of HLA rs6906021 tend to be a predictor of DILI. The significant associations are also shown by G carriers of HLA rs1063355 which could protect the patients from the DILI (OR: 0.39; 95% CI: 0.14–0.9) and the C carriership of HLA rs1041981 which can also protect the patients from DILI (OR: 0.38; 95% CI: 0.15–0.50). [Table 4] shows that only 13.9% of the patients had an isoniazid plasma concentration in the normal range; furthermore, 0.66%, 41.9%, and 2.90% of the patients had plasma concentration of ethambutol, pyrazinamide, and rifampicin, respectively, in the normal range. According to the therapeutic range, 99.3% and 70.2% of the patients had ethambutol and rifampicin concentrations under the normal range. About 79% of the patients had high isoniazid concentration (above the therapeutic range) and 53% had high pyrazinamide concentrations. According to the acetylator category, 86.3% slow acetylators had Isoniazid (INH) concentration higher than upper range concentration. This pattern also can be seen in the extensive acetylators patients, even though the proportion of patients is lower than slow acetylators. According to the 57 data of isoniazid plasma concentration, only 37 patients experienced DILI. [Table 5] presents the association between gene polymorphisms and isoniazid plasma concentration. Patients with high isoniazid plasma concentration have 2.6 times higher risk of experiencing DILI (95% CI; 0.5–13.1). The slow acetylators of NAT2 and homozygous deletion of GSTT1 and GSTM1 have a risk of having high isoniazid plasma concentration as amounting to 3.0, 1.1, and 1.36, respectively (95% CI: 0.7–20.7; 1.0–1.3; 0.2–9.1). 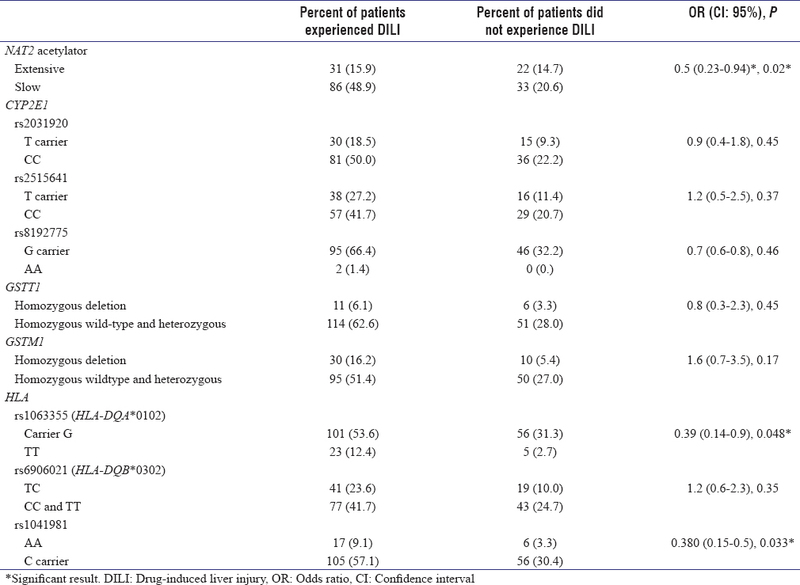 [Table 6] shows the significant difference in isoniazid concentration among the genotypes of HLA-DQB*0302. However, there is no significant difference in isoniazid concentration among the genotypes of HLA-DQA*0102 and rs1041981. The TC genotype has the highest isoniazid plasma concentration compared to CC and TT (P = 0.017). 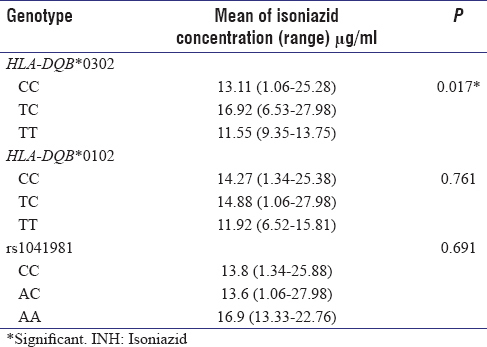 The isoniazid plasma concentrations in the TC genotype are above the normal range (3–6 μg/ml). This data support the previous data that patients with the TC genotype had 1- and 2-time risk to experience DILI (95% CI: 0.6–2.3). Multinomial logistic regression was performed among phenotype of NAT2, GSTT1, GSTM1, rs2031920 (CYP2E1), rs2515641 (CYP2E1), rs1041981 (HLA), rs1063355 (HLA), and rs6906021 as independent variables and DILI as a dependent variable. The authors found that G carriers of HLA-DQA*0102 have a protective effect against DILI compared to T carriers (OR: 0.38; 95% CI: 0.15–0.95). Our study showed that slow acetylators of the NAT2 phenotype are highly prevalent in this cohort of Indonesian patients. There are some variations in the genotypes of CYP2E1 in rs2031920, rs8192775, and rs2515641. Furthermore, the GSTM1 homozygous deletion is predominant in the study population. The variations of HLA-DQA*0102 and HLA* DQB0302 are also available. A statistically significant association with genetic variants was found between DILI and NAT2 phenotype and G carriers of HLA-DQA*0102. Furthermore, a significant association between H-concentration and C carriers of HLA-DQB*0302 was found, but not between DILI and C carriers of HLA-DQB*0302. Extensive acetylators and G carriers of HLA-DQA*0102 may protect against DILI. Trends were found for the slow acetylators of NAT2, T carrier of CYP2E1 rs2516451, and homozygous deletion of GSTM1 which are related to a higher number of patients with DILI. This finding is also supported by the previous meta-analysis of 13 randomized studies with rapid and slow acetylators. The rapid acetylators may predict the treatment failure, the absence of ADR, and relapse possibility. This study also suggested that the treatment failure and ADR were significantly associated with the pharmacokinetics of this single drug in the combination. Even though the significant associations were only presented between the NAT2 and DILI, our study showed that some variations of the gene may predict the incidence of DILI, such as the slow acetylators of NAT2, T carrier of CYP2E1 rs2516451, and homozygous deletion of GSTM1, which are related to the higher number of patients with DILI. These results are also supported by the high plasma concentrations of INH in the slow acetylators of NAT2, T carrier of CYP2E1 rs2516451, and homozygous deletion of GSTM1. The previous study in Japan about the NAT2 genotype-guided regimen presented that 78% patients with standard treatment of TB experienced DILI; however, none of the patients with pharmacogenetic screening-guided treatment experienced DILI or failure of the treatment. Regarding the INH concentration, both slow and extensive acetylators showed the high concentration exceeds the upper limit of INH's range concentration. Remarkably, the proportion of patients with the high concentration of INH in the slow acetylators group was higher than the extensive acetylators group. These results were also supported by the previous study conducted in India. TB patients with slow acetylators had higher concentrations of INH than patients with intermediate and rapid acetylators and the INH concentration among the three groups was significantly different. India's study also presented that patients with slow, intermediate, and rapid acetylators had lower INH concentration, which was <3 μg/ml. The presence of slow acetylators of NAT2 (37%) in Colombian Caribbean Coast region which may predict the DILI was consistent with our study results. The Chinese population also showed similar results of slow acetylators of NAT2 which had higher risk of DILI. Our study is also supported by another previous study in Thai populations. The slow acetylators had a higher frequency of DILI than the immediate and rapid acetylators in the group of patients. However, in the control group, the intermediate acetylators had the highest frequency. This confirmed earlier results showing that slow acetylators of NAT2 both in Asian and non-Asian population had higher risk of DILI. In the Moroccan population, the frequency of c1/c1 of CYP2E1 rs2031920 was around 98%, also in the other populations such as Turkish, Germanians, Serbians, French, English, and Brazilians. However, the frequency of c1/c1 of CYP2E1 rs2031920 in Taiwanese and Chinese was around 50%. These results are different from our study which shows that the percentage of the CC genotype of CYP2E1 rs2031920 reaches 70% and the T carriers of this SNP had a risk of having high isoniazid plasma concentration. Contradictorily, according to the meta-analysis of the CYP2E1 rs2031920, the c1/c1 genotype was related to DILI, especially in the Chinese and Korean population. In the Indian population, the risk of DILI did not associate with the polymorphisms of rs2031920 of CYP2E1. The HLA gene was supposed to have a correlation with the incidence of pulmonary TB due to the immunity mechanism. In some specific areas in India, some haplotypes of HLA were found in pulmonary TB patients., Our study found that the G carriers of HLA-DQA*0102 had more protection to the DILI, although the H-concentrations were not associated with the genotype. This finding is supported by a previous study in North Indian which stated that the absence of HLA-DQA*0102 and the presence of HLA-DQB1* 0201 became the independent factor of ATDH. To the best of the authors' knowledge, the significant difference of isoniazid plasma concentration among the genotype of HLA-DQB*0302, although not accompanied by associations with DILI is a new finding in the Indonesian population. The limited sample size and limited pharmacokinetic assessment by measuring only C2 concentrations are important limitations of our study. An increased sample size number in combination with a full pharmacokinetic curve allowing correlation with actual Cmax and AUC will likely increase the statistical power. We conclude that in the Indonesian population, the NAT2 genotype, but not the CYP2E1, GSTM, and GSTT1 genotype, is significantly associated with DILI. Furthermore, the absence of HLA-DQA*0102 could protect the patients from DILI without being associated with an effect on the H-concentration in contrast to the NAT2 genotype. C carriership of HLA-DQB*0302 is significantly associated with increased H-concentrations, but not with DILI. The authors would like to thank the Staffs in Public Health Centers in Yogyakarta and Lampung, Lung Hospitals in Yogyakarta region and Staffs in Genetic Laboratory, University of Groningen, The Netherlands. This study was financially supported by the Directorate General of Higher Education, Indonesia, and the National Health Institute, Indonesia. World Health Organization. Global Tuberculosis Report 2017. World Health Organization; 2017. Available from: http://www.who.int/tb/publications/global_report/en/. [Last accessed on 2017 Jul 11]. Hofman S, Segers MM, Ghimire S, Bolhuis MS, Sturkenboom MG, Van Soolingen D, et al. Emerging drugs and alternative possibilities in the treatment of tuberculosis. Expert Opin Emerg Drugs 2016;21:103-16. Blomberg B, Fourie B. Fixed-dose combination drugs for tuberculosis: Application in standardised treatment regimens. Drugs 2003;63:535-53. Tostmann A, Boeree MJ, Aarnoutse RE, de Lange WC, van der Ven AJ, Dekhuijzen R, et al. Antituberculosis drug-induced hepatotoxicity: Concise up-to-date review. J Gastroenterol Hepatol 2008;23:192-202. Common Terminology Criteria for Adverse Events version 4.0; (n.d.). Available from: http://www.evs.nci.nih.gov/ftp1/CTCAE/CTCAE_4.03_2010-06-14_QuickReference_5x7.pdf. [Last accessed on 2017 Jul 11]. GOT; (n.d.). Available from: http://www.prodia.co.id/ProdukLayanan/PemeriksaanLaboratoriumDetails/GOT. [Last accessed on 2017 Jul 11]. GPT; (n.d.). Available from: http://www.prodia.co.id/ProdukLayanan/PemeriksaanLaboratoriumDetails/GPT. [Last accessed on 2017 Jul 11]. Mishra S, Daschakraborty S, Shukla P, Kapoor P, Aggarwal R. N-acetyltransferase and cytochrome P450 2E1 gene polymorphisms and susceptibility to antituberculosis drug hepatotoxicity in an Indian population. Natl Med J India 2013;26:260-5. Mishra G, Kumar N, Kaur G, Jain S, Tiwari PK, Mehra NK, et al. Distribution of HLA-A, B and DRB1 alleles in Sahariya tribe of North central India: An association with pulmonary tuberculosis. Infect Genet Evol 2014;22:175-82. Tang N, Deng R, Wang Y, Lin M, Li H, Qiu Y, et al. GSTM1 and GSTT1 null polymorphisms and susceptibility to anti-tuberculosis drug-induced liver injury: A meta-analysis. Int J Tuberc Lung Dis 2013;17:17-25. Santos NP, Callegari-Jacques SM, Ribeiro Dos Santos AK, Silva CA, Vallinoto AC, Fernandes DC, et al. N-acetyl transferase 2 and cytochrome P450 2E1 genes and isoniazid-induced hepatotoxicity in Brazilian patients. Int J Tuberc Lung Dis 2013;17:499-504. Gupta VH, Amarapurkar DN, Singh M, Sasi P, Joshi JM, Baijal R, et al. Association of N-acetyltransferase 2 and cytochrome P450 2E1 gene polymorphisms with antituberculosis drug-induced hepatotoxicity in Western India. J Gastroenterol Hepatol 2013;28:1368-74. Buchard A, Sanchez JJ, Dalhoff K, Morling N. Multiplex PCR detection of GSTM1, GSTT1, and GSTP1 gene variants: Simultaneously detecting GSTM1 and GSTT1 gene copy number and the allelic status of the GSTP1 ile105Val genetic variant. J Mol Diagn 2007;9:612-7. Heysell SK, Moore JL, Keller SJ, Houpt ER. Therapeutic drug monitoring for slow response to tuberculosis treatment in a state control program, Virginia, USA. Emerg Infect Dis 2010;16:1546-53. Saktiawati AM, Sturkenboom MG, Stienstra Y, Subronto YW, Sumardi, Kosterink JG, et al. Impact of food on the pharmacokinetics of first-line anti-TB drugs in treatment-naive TB patients: A randomized cross-over trial. J Antimicrob Chemother 2016;71:703-10. Jaikishin JA, Perwitasari DA, Darmawan E, Mulyani UA. Validation of isoniazid for therapeutic drug monitoring in human plasma by high- performance liquid chromatography. In: AIP Conference Proceedings 1746, 020030 (2016); 2016. Mulyani JA, Darmawan E, Perwitasari DA, Mulyani UA. Validation of pyrazinamide in human plasma using Hplc-Uv for therapeutic drug monitoring. In: AIP Conference Proceedings 1746, 020030 (2016); 2016. FDA Guidance for Industry. Bioanalytical Method Validation, Freedom of Information Staff (HFI 35), Food and Drug Administration Rm 12 A - 30, 5600 Fish. Lane, Rockville, MD, USA; 2001. Available from: https://www.fda.gov/downloads/drugs/guidances/ucm070107. Pdf. [Last accessed on 2016 Jan 20]. Pasipanodya JG, Srivastava S, Gumbo T. Meta-analysis of clinical studies supports the pharmacokinetic variability hypothesis for acquired drug resistance and failure of antituberculosis therapy. Clin Infect Dis 2012;55:169-77. Azuma J, Ohno M, Kubota R, Yokota S, Nagai T, Tsuyuguchi K, et al. NAT2 genotype guided regimen reduces isoniazid-induced liver injury and early treatment failure in the 6-month four-drug standard treatment of tuberculosis: A randomized controlled trial for pharmacogenetics-based therapy. Eur J Clin Pharmacol 2013;69:1091-101. Hemanth Kumar AK, Ramesh K, Kannan T, Sudha V, Haribabu H, Lavanya J, et al. N-acetyltransferase gene polymorphisms & plasma isoniazid concentrations in patients with tuberculosis. Indian J Med Res 2017;145:118-23. Arias I, Lecompte N, Visbal L, Curiel I, Hernández E, Garavito P, et al. NAT2 gene polymorphisms in three indigenous groups in the Colombian Caribbean Coast region. Colomb Med (Cali) 2014;45:148-53. An HR, Wu XQ, Wang ZY, Zhang JX, Liang Y. NAT2 and CYP2E1 polymorphisms associated with antituberculosis drug-induced hepatotoxicity in Chinese patients. Clin Exp Pharmacol Physiol 2012;39:535-43. Wattanapokayakit S, Mushiroda T, Yanai H, Wichukchinda N, Chuchottawon C, Nedsuwan S, et al. NAT2 slow acetylator associated with anti-tuberculosis drug-induced liver injury in Thai patients. Int J Tuberc Lung Dis 2016;20:1364-9. Wang PY, Xie SY, Hao Q, Zhang C, Jiang BF. NAT2 polymorphisms and susceptibility to anti-tuberculosis drug-induced liver injury: A meta-analysis. Int J Tuberc Lung Dis 2012;16:589-95. Deng R, Yang T, Wang Y, Tang N. CYP2E1 rsaI/PstI polymorphism and risk of anti-tuberculosis drug-induced liver injury: A meta-analysis. Int J Tuberc Lung Dis 2012;16:1574-81. Liu F, Jiao AX, Wu XR, Zhao W, Yin QQ, Qi H, et al. Impact of glutathione S-transferase M1 and T1 on anti-tuberculosis drug-induced hepatotoxicity in Chinese pediatric patients. PLoS One 2014;9:e115410. Li C, Long J, Hu X, Zhou Y. GSTM1 and GSTT1 genetic polymorphisms and risk of anti-tuberculosis drug-induced hepatotoxicity: An updated meta-analysis. Eur J Clin Microbiol Infect Dis 2013;32:859-68. Sharma SK, Balamurugan A, Saha PK, Pandey RM, Mehra NK. Evaluation of clinical and immunogenetic risk factors for the development of hepatotoxicity during antituberculosis treatment. Am J Respir Crit Care Med 2002;166:916-9.